The BOB & TOM Show put the power of funny into action in Vienna, WV, on Friday, April 12th, helping the United Way Alliance of the Mid-Ohio Valley raise a record $1,003,500 through the sold-out fourth annual Laugh United: A Night of Cocktails and Comedy fundraiser. 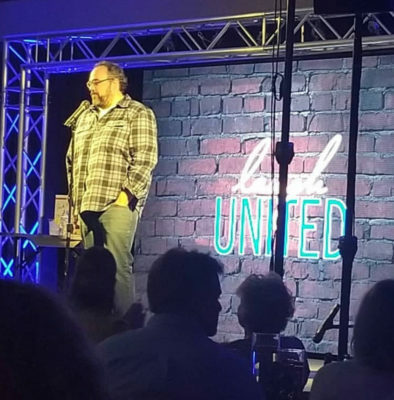 Touring comedian and BOB & TOM Show cast member Josh Arnold performed with fellow veteran touring comics and BOB & TOM Show comedy legends Greg Hahn, Jack Freeman and Henry Phillips at the Grand Pointe Conference Center in Vienna. The BOB & TOM Show is heard weekday mornings on longtime affiliate Active Rock station 103.1 The Bear WHBR-FM in Parkersburg, WV. The United Way supports, collaborates with and provides funding for more than 80 programs and initiatives in the region, which focus on the education, financial stability and health of every person in the Mid-Ohio Valley.